Felicity Evans is a journalist and broadcaster of nearly twenty years’ experience. Felicity currently presents Open Country on BBC Radio 4 and Good Morning Wales and the current affairs programme Eye on Wales on BBC Radio Wales. Felicity has also presented The World Tonight, Any Answers and Saturday PM on Radio 4, Newshour on BBC World Service Radio, and Good Evening Wales on Radio Wales. Her television experience includes presenting the live weekly politics programme Dragon’s Eye and The Politics Show as well as BBC Wales’ television current affairs programme Week In Week Out. 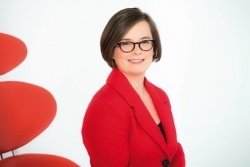 Felicity Evans has extensive experience of hosting cultural, business and political events. Felicity has chaired numerous panels for the Hay-on-Wye philosophy festival “How the Light Gets In”, as well as hosting events for a wide variety of organisations including the IWA, IoD, ACCA and the Electoral Commission. Felicity Evans is an Oxford law graduate and she retains a strong interest in legal affairs. Felicity also enjoys a variety of cultural pursuits especially the visual arts and reading. She loves cycling around town, visiting interesting places and playing squash (badly). The adoption of a rescue Staffordshire Bull Terrier into the family has made her fall in love with dogs generally and Staffies in particular. Felicity‘s interested in history and social theory as well as issues around gender, race and sexuality. Felicity is learning the ukulele, for which she has developed a great passion. Everyone else at home has developed great forbearance.